Overall, we found the 2007 wines to be leaner than those from 2005 and 2006. They are lovely, but I’d be choosy about the ones to cellar. You’ll find no airs of wine snobbery from this very famed family of Burgundy. These people were so lovely on our first visit that regardless of the wine, I would have purchased from them. And then… I tasted the elegant Laurène. This one is a must visit. Located right next door to Robert Parker’s Beaux Frères, this winery was a beautiful find and benefitted from being some of the same land area but with wines a little lower in price point. The vineyard has both Jory (volcanic) and Willakenzie (marine sedimentary) soils which made for an interesting taste comparison. The whites were delicious and very reasonably priced for their quality. We also picked up a few of the Pinot futures. We met Patricia – she seemed like a blast and oozed with good chi – sort of Patricia Field in North Face gear, but without pink hair. Pinots, Marine Sedimentary Soil (Willakenzie): – We tended to favor the wines from marine sedimentary soil to the those from volcanic soil. The dark brown sandstone and shale Willakenzie soil has a slightly higher pH (5.9) than that of the dark reddish brown Jory soil (5.6). While there are many factors involved in the production of wine, overall, we found the marine sedimentary soil wines at Patricia Green to have a little more elegance, lingering spice and minerality. With a few wines highly rated in years past, I called in advance to see if we needed an appointment to do a tasting. The owner (Craig) is the sweetest man. I felt like I was calling their house every time we spoke on the phone. It’s pretty far from the main drag in the Willamette Valley, so we opted to pass on the actual visit to the vineyard, but purchased a few of his wines from Ponzi’s store. Ponzi makes beautiful pinots. I’ve had various vintages of their Pinot Reserve Willamette Valley as part of our cellar over the years. 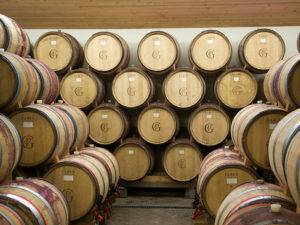 We’ve only been to their wine bar where they offer flights from a wide variety of wine makers in the Willamette Valley. The tasting room is central to the main drag and a must do. This is where you need to hit when you’re rounding off your case(s) to ship back home. We waited to get on their wine club list for almost 2 years. They have wonderful wines and always throw in a surprise or two. We were pleasantly surprised by their Riesling and Viognier this past time around. If you seek a comprehensive tour of a wine making facility in the Willamette Valley, this would be one I would add to my list. A nice little surprise… we ended up waiving in the Cuvée A and the Château Benoit in years past – both very reasonably priced and perfect for summer nights for our “house wines” of 2008. You really can’t go wrong with the quality and price point. The view from the tasting room is also special.